After years covering politics, faith, and society in general here at my website, I switched to strictly baseball, the Phillies this year in particular. In that previous incarnation, I annually honored an American of the Year at the end of each calendar year. With the changed emphasis, this year I will begin honoring a Philadelphia Phillies organizational Person of the Year with this most recently completed 2014 season. The Person of the Year honor can go to anyone in the organization, major or minor leagues, for an outstanding performance, act, or work, or for career achievements. The recipient of the first-ever Phillies Person of the Year honor is shortstop Jimmy Rollins. In being so named, JRoll was selected ahead of worthy nominees in Major League 2nd baseman Chase Utley and starting pitcher Cole Hamels, and minor league shortstop J.P. Crawford. Fans of the Philadelphia Phillies remember Brett Myers as a key starting pitcher during the 2000’s, especially with the 2008 World Series champions, or as the closer for the 2007 NL East champions. But most fans of the team have likely lost contact with the sometimes controversial righthander since he signed as a free agent with the Houston Astros following the 2009 season. Well, Brett Myers has resurfaced in recent days in a somewhat surprising role: country singer. 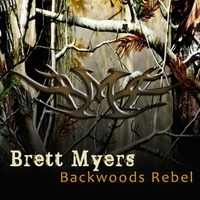 Myers has released his debut EP “Backwoods Rebel“, a nickname which also happens to be a part of his Twitter handle @BackWoodRebel39. In the 5-song set, Myers sings mostly about a pair of country classic topics: drinking and women. “I Need a Drink“, “Black Creek“, “Chasing Tail“, “Beer Hand Strong“, and his first single “Kegerator” pretty much sum up the selections in their titles alone. While the topics are simplistic and foster the good ol’ boy stereotype, fact is that this is not a bad initial effort. If a recording career in the country genre is something that the now 34-year old ex-hurler is hoping to pursue, he may have something. A native of Jacksonville, Florida, Myers has long fostered a countrified image. During the 2008 season, he and fellow rotation mate Joe Blanton were frequently spotted in the clubhouse wearing red “Redneck Wrecking Crew” t-shirts. For folks who already are fond of making fun of country music and it’s lifestyle, you’ll probably hear terms like “hillbilly“, “yokel“, and that same “redneck” tossed around in disparaging tones. There may even be “wife beater” references to the ugly incident back in August of 2006 when Myers, a former boxer, allegedly beat his wife Kim on the streets of Boston while the Phils were there on a road trip. Myers and his wife, who bailed him out and stood by him following that Boston incident, appear to have put the ugly past behind them, and continue to raise two young children together. Brett and Kim Myers celebrated winning a World Series together. They have enjoyed a pro baseball lifestyle that earned him almost $60 million in total salary over 11 seasons. Whether they can survive his attempts at a music career remains to be seen. The MLB Network is beginning the process of selecting its 3rd annual “Face of MLB” with the selection of each club’s “Face of the Franchise” nominee. By following certain hashtags on Twitter, fans do the selecting of which of their team’s stars will represent them in the overall competition. Blue Jays – Jose Bautista, Braves – Freddie Freeman, Padres – Seth Smith, Pirates – Andrew McCutchen, Reds – Todd Frazier, Dodgers – Clayton Kershaw, Twins – Joe Mauer, Tigers – Miguel Cabrera, Angels – Mike Trout, White Sox – Chris Sale. The Phillies will be one of the final teams for fans to vote on, likely due to the anticipated transitions in the roster this off-season. Fans of the club should be following @FS_TBOH. 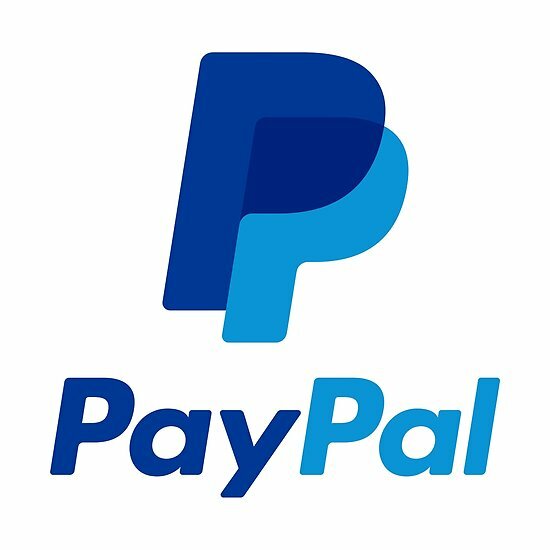 As with all developments related to the team we will be keeping you updated. We’ll announce when the voting starts, and give updates during the process, finishing with the announcement of the nominee. Once all nominees are selected from each of the 30 clubs, they are positioned in a ‘March Madness’ style bracket. In each pairing, baseball fans will then be asked to vote for their favorites, and voting will continue until a final overall ‘Face of MLB 2015′ is selected. In both 2013 and 2014, the Phillies nominee was 2nd baseman Chase Utley. In 2013, Utley was upset in the first round by DBacks catcher Miguel Montero. Last year, Utley defeated Rays 3rd baseman Evan Longoria in the first round, but then was dumped by Mariners pitcher Felix Hernandez in the 2nd round. The 2013 winner was Cincinnati Reds 1st baseman Joey Votto, who had upset Derek Jeter in the semi-finals and then defeated Matt Kemp in the final vote. The 2014 winner was New York Mets 3rd baseman David Wright, who edged out underdog Eric Sogard of the Oakland A’s. Wright receives a first-round bye as the defending ‘Face of MLB’, as does the nominee of the World Series-winning San Francisco Giants. That San Francisco nominee has not yet been determined. The Phillies eventual 2015 nominee will be pitted in a first-round matchup with the nominee from the Washington Nationals. This could be a tough matchup, with the Nats popularity high. Their fans will be active on social media, so it will be up to Phillies fans to really get behind our candidate. 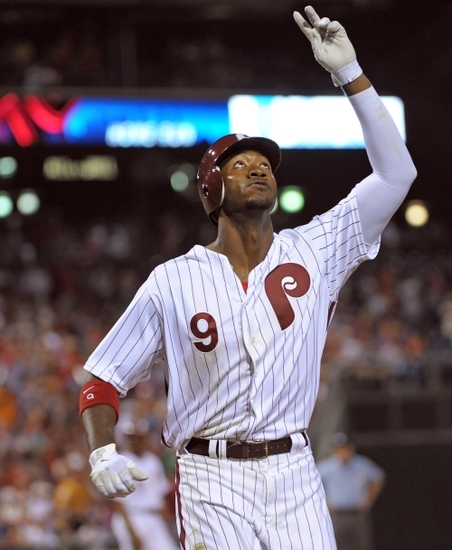 So who should be the 2015 “Face of the Phillies” in the upcoming vote? By any reasonable measure, if voting is taken seriously, there are two clear candidates: the 2-time defending nominee Chase Utley, and starting pitcher Cole Hamels. TBOH will be getting behind one of these two players. We’re looking for YOUR input. 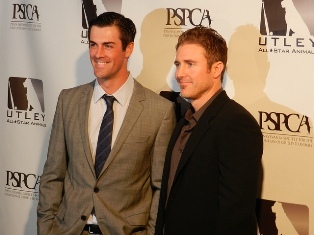 Let us know who you feel should be the competition nominee, Utley or Hamels. Whomever gets the most support in the coming days will get our backing. So what do you think? Who do you feel should be the 2015 “Face of the Phillies”, representing the team in this fun MLB Network voting process? Stop by the@FS_TBOH site at Twitter and add your voice. A month from now, Carlos Ruiz, the beloved fan favorite Phillies catcher known as “Chooch”, will turn 36 years old. He is the least discussed member of the club’s ‘Glory Era’ aging stars in public trade talks. So, is Chooch on the trade block? Let’s first look at what he has to offer. What would any team that might need a catcher find attractive about the Phillies veteran? Despite playing the most difficult, physically demanding position on the field, Ruiz has been healthy and reliable. Since his first full season in 2007, Ruiz reached at least 370 plate appearances in 7 of 8 years. He has, in fact, gone over 400 plate appearances 5 times, including in 4 of the last 5 seasons. Yes, Chooch is turning 36. But he is healthy, strong, and remains one of the best defensive catchers in baseball. Based on FanGraphs values which were looked at this past season, based themselves on fWAR value, Ruiz was the 6th-most valuable catcher in the game behind elite names like Brian McCann, Yadier Molina, Buster Posey, Russell Martin, and Miguel Montero. Phillies lefty ace Cole Hamels turns 31 years old today. He has pitched in the better part of 9 big league seasons now. He has never suffered any serious injury. In short, Cole Hamels is in his prime. Taken by the Phils with the 17th overall pick in the 2002 MLB Draft, Hamels reached the Majors 4 years later at age 22. In those ensuing 9 seasons, Hamels has put together a remarkable record. He is 108-83 with a 3.27 ERA and 1.142 WHIP for his career. Perhaps just as importantly as his excellence, he has been healthy and dominant. He has pitched 1,801.1 innings with a 1,707-453 K/BB ratio. Hamels has exceeded the 180 innings pitched mark in every one of his 8 full seasons, and has gone over the 200 inning mark in 7 of the 8 years. In the year he missed, he threw 193.2 innings. The lefty is currently working with a 7-year, $159 million contract that began running in 2012. It takes him through the 2018 season at $23.5 million per year, with a 2019 option for $20 million more. In today’s MLB world, in what has become an $8+ billion industry, and where cost certainty is cherished by all organizations, Hamels contract is absolutely in line with his age, experience, record, talent, and health. After almost 13 years, will this be Cole Hamels final birthday celebrated as a member of the Philadelphia Phillies organization? Only time will tell on that count. But one thing is certain: Hamels clearly is still in his prime. Signed for 4-5 more years, years which his history suggests he should remain elite, he should be dealt only if the return is also prime. The Phillies made Cameron Rupp their 3rd Round pick in the 2010 MLB Draft. 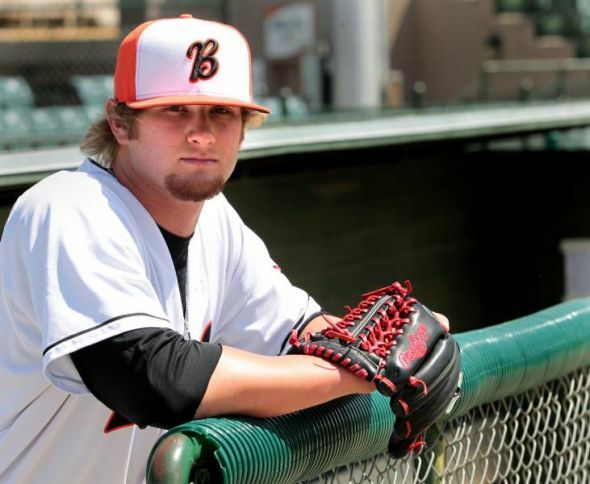 A catcher out of the University of Texas, Rupp advanced through the minor league system a level at a time over the next few years. In 2012 at High-A Clearwater, Rupp’s bat began to display some pop. He cracked 22 doubles and had 10 homers with the Threshers. Rupp then split 2013 between AA-Reading and AAA-Lehigh Valley, and against the more advanced pitching he increased his homer total to 14. In September of that 2013 season, Rupp received his first callup to the Big Leagues. It was the classic ‘cup of coffee’, as he appeared in just 4 games, making 3 starts, going 4-13 with a double and 2 RBI. Rupp was back at Lehigh Valley to start the 2014 season. But a June injury to starter Carlos Ruiz resulted in his 2nd callup. For a month from late June through late July, Rupp was the regular starter. In 16 games he hit just .183 with 4 doubles and 6 RBI. Now entering the 2015 season, assuming the club makes no significant moves at the position, Rupp should be the backup to fan favorite Chooch all year long. This means that the 26-year old will be an injury to the 36-year old Ruiz away from the starting catcher role. Rupp is more suited to a backup role than an everyday starter behind the plate. That’s what the team will be getting if he is forced into a heavier workload. He is a decent receiver with a strong arm defensively. Offensively he has some pop, but is a weak overall hitter with no speed and with holes in his swing. Cameron Rupp has been a high draft pick, has worked his way through the Phils system, and has gotten a taste of the Majors. As long as it’s in the backup catcher role, he should be ready for an increased opportunity with the Phillies in 2015. Phillies Christmas stockings: coal or gifts? It’s Christmas morning, and all across the Delaware Valley folks are waking to find presents under the Christmas tree and stockings stuffed with gifts. But what about the Phillies? For their 2014 performance, what did we leave in their TBOH Phillies Christmas stockings: gifts or coal? 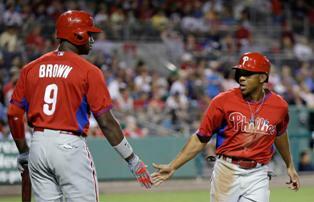 Domonic Brown: the worst player on the roster in 2014, especially given his playing time. Also, easily the biggest disappointment, coming off what was hoped to have been a breakout 2013 All-Star campaign. His season was a disaster: a .235 batting average, .285 on-base percentage in 512 plate appearances. Hit just 10 homers, scored just 43 runs, and was the worst player on the roster in WAR. Could Phils' Middleton Become "Steinbrenner South"? In bits and pieces, CSN Philly is rolling out an exclusive interview conducted by insider Jim Salisbury with departing franchise icon Jimmy Rollins. 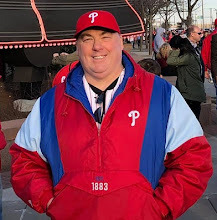 In one of the segments, JRoll refers to a member of the Phillies ownership group, John S. Middleton, as wanting to become “Steinbrenner South” in building a consistent winner. For most Phillies fans, ownership of the team is nebulous at best. So a bit of a primer is in order to let you know who owns the team, who is in control, and who exactly is John S. Middleton. In 1981, a group of investors was put together by Bill Giles to purchase the Phillies from Ruly Carpenter, whose family had owned the team for more than a half-century. This limited partnership, in which no one owned a majority of the club, included Giles, Middleton, current ailing club president David Montgomery, and members of the Buck and Betz families. The Phillies Winter Banquet circuit takes players, coaches and staff on a tour around the various minor league affiliates as an opportunity for fans in those locales to meet the big leaguers. It is also an important fund-raising charitable opportunity. Phils manager Ryne Sandberg leads the contingent this time around, and he will be joined by various players at the different minor league venues in Lakewood, Reading, and out in the Lehigh Valley. On Tuesday evening, January 20th at the Crowne Plaza Hotel in Reading, PA the doors will open for a cocktail hour beginning at 5:30pm. This will be followed by the actual banquet at 6:30pm. In addition to Sandberg, the scheduled guests of honor are players Ben Revere, Domonic Brown, and Ken Giles. This event in Reading will benefit Baseballtown Charities. For reservations you can call 610-370-BALL, or visit the Ticket Office at FirstEnergy Stadium in Reading, or visit Fightins.com for more information. Baseballtown Charities keeps the game alive in Reading through programs that honor the city’s baseball history, and secure its future by giving kids the chance to play and learn from the game’s life lessons. The banquet circuit moves to the Woodlake Country Club in Lakewood, NJ the following evening of January 21st. Here the gates will open at 6pm, with the event beginning at 6pm. A full 3-course dinner will be served, and your $40 tickets will benefit BlueClaws Charities and their community partners program. The guests of honor in Lakewood are again scheduled to be Sandberg and players Revere, Brown, and Giles. Tickets can be purchased online at the Lakewood Blue Claws MiLB site, or by calling JoAnne Bell at 732-901-7000 ext 100. You will be asked to choose between Roast Sliced Sirloin, Chicken Francaise, or Flounder Bella Vista for your dinner main course. Finally, the Lehigh Valley banquet stop will take place on Thursday, January 22nd, with a cocktail hour beginning at 6pm at the Sands Event Center in Bethlehem, PA. Tickets here are $85 per person, tables of 10 for $775. There are also “Championship Table” setups available at $1,500 which allow entrance to a private pre-event reception. This Lehigh Valley event benefits IronPigs Charities, and the guests of honor include Sandberg, Revere, and Brown joined this time by both Darin Ruf and David Buchanan. To order tickets, call 610-841-PIGS, or you can email Dana DeFilippo at ddefilippo@ironpigsbaseball.com, or order online at the Lehigh Valley IronPigs winter banquet site.